Robert Wilson and his brother Blake persuade their town to purchase what they claim to be a miracle pill, invented by their late father, the scientist Dr. Wilson. The pill is actually a placebo made of nothing but sugar, but the town, believing it to be real, becomes carried away with the ‘miracles’ that the pill is reportedly responsible for. Robert and Blake’s plan is wildly successful…but at what cost? PLACEBO is a story about dreams, and questions the idea of reality in a world where what isn’t ‘real’ often appears more promising. PLACEBO was conceived and written by Danny Abosch and Joshua Borths from 2009-2010 while students at the University of Michigan. In November of 2010, it was produced on campus by Basement Arts for four sold-out performances. A cast recording was also recorded with full cast and orchestra. More information about this production is available here. 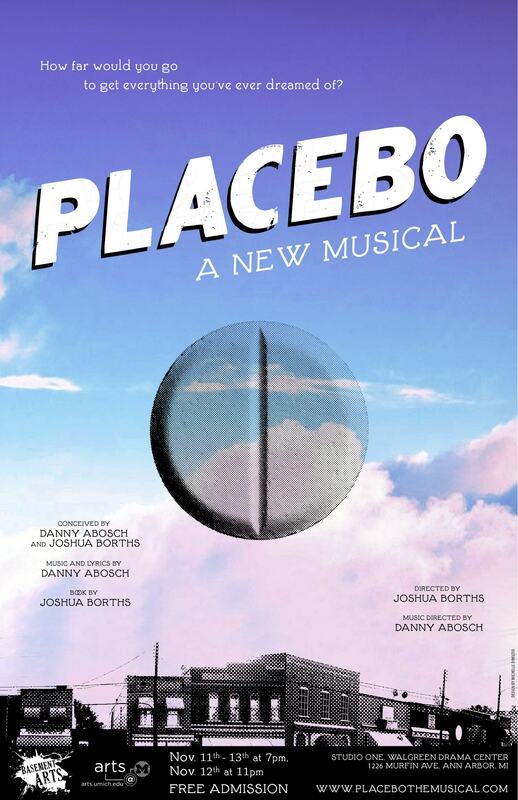 Placebo was selected from 26 new musicals to be workshopped at Oklahoma City University in February 2011, and was also workshopped at Emerson College in May 2011. In 2012, PLACEBO won the Pasadena Musical Theatre Program Development Award, which included a fully-produced workshop at the Pasadena Playhouse, directed by Ryan Scott Oliver. PLACEBO was also given a reading at Pace University. Please contact us if you are interested in helping to further develop PLACEBO. *Are you a high school teacher or community theatre director? PLACEBO is now available for licensing. Click here for more information.